Well, I was a little bummed! There was a cat show this weekend, but TICA doesn’t have a Pet Me Cat program, so I had to stay home. But my human went to help out my breeder with her kittens. Remember my niece Billie? She was there, as was her brother Louie. My human took Billie to all the rings both days. As you can see, she has gotten a lot more poised since the last time my human saw her a few weeks ago. She is also way more curious about her surroundings and enjoying checking everything out. 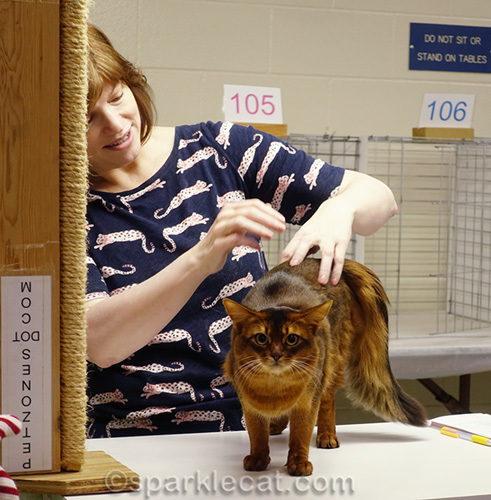 Billie was much more comfortable with the judges. She even looked like she was enjoying herself. Then there was Louie… he is a maniac! 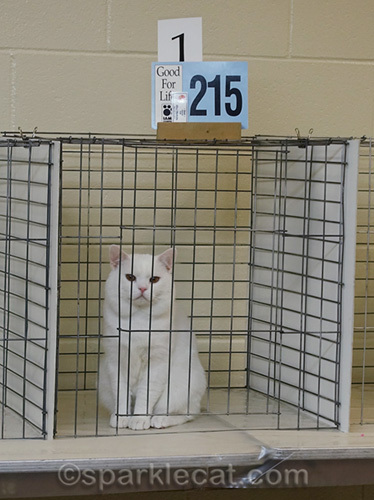 He earned a regional kitten win last season so he needed photographs. 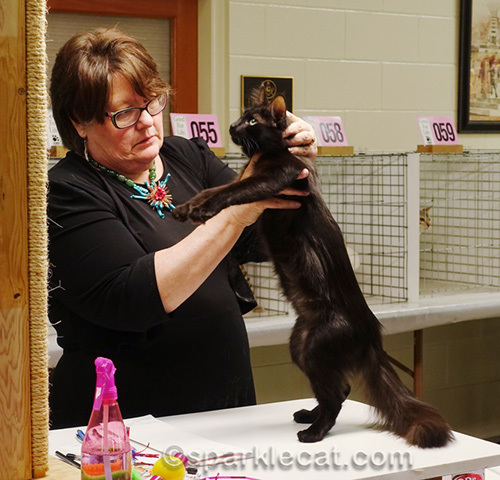 Our breeder took him to the show photographer for pictures, and my human came along — and wound up having to play cat wrangler! He kept leaping off the table and running around and playing hide and seek by the sofa. When my human went to fetch him, he licked her face. He thinks everybody is his best pal. The judges certainly liked him a lot. 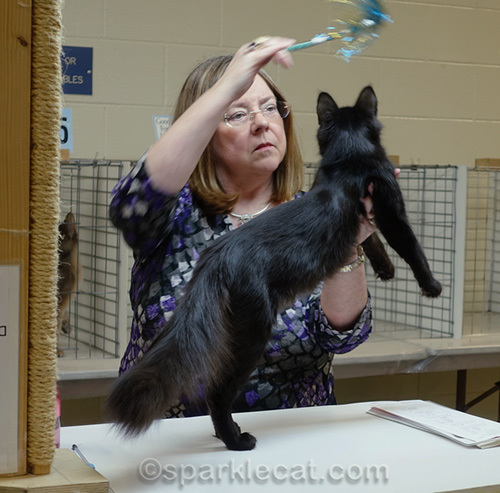 He has developed more quickly than Billie, so Louie got the Best Somali kitten ribbons in the rings. I don’t think Billie minded. My half brother Sizzle was there too, looking handsome. He got a couple of finals over the weekend. There was also a three-way Supreme party! It was to celebrate my half-sister Vana, and my pals BJ and Bing getting their Supreme titles. Vana and BJ weren’t there, but it didn’t matter because it looks like it was all human food at the table. They had so many sweets and desserts, in fact, they wound up having the party again the next day, and included an American Curl who Supremed that weekend. Some of you may remember Bing from my first Portland show. He’s a Manx and just an all-around great cat. As you can see, he continued his winning ways during this show. 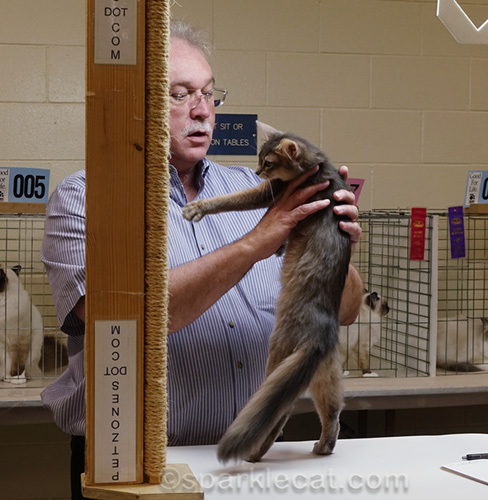 He was the Number One best cat in this judging ring. 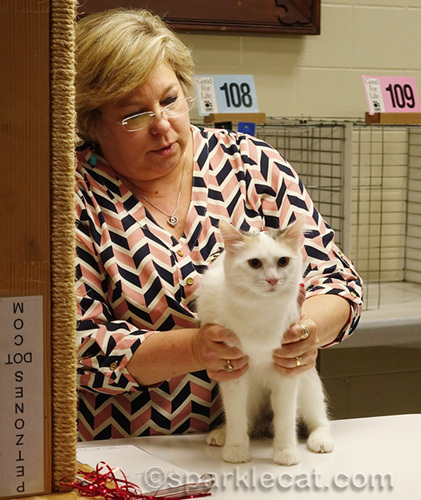 There were other friends there too, like this Turkish Angora kitten, Mace. He lives with BJ’s human. He was a big hit with the judges. The thing my human liked the best about him is he totally has a BatCat silhouette! Which is one big difference between Turkish Angoras and Somalis. The Turkish Angora breed standard requires the BatCat ears (although they don’t call them that). Somali ears need to be wide set to fit our breed standard. 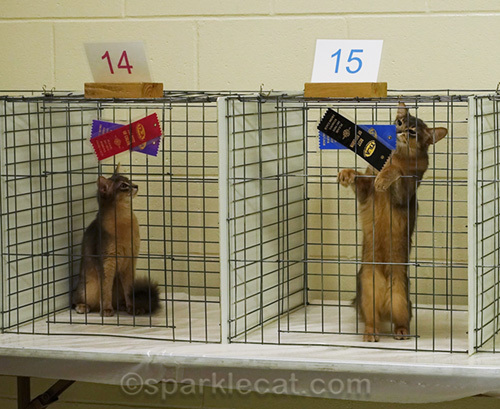 Louie and Mace were often next to each other in the judging ring… and they had a great time fooling around. My human’s friend who breeds Turkish Vans was also there with kittens, and she was showing one of her girls, Sabri. 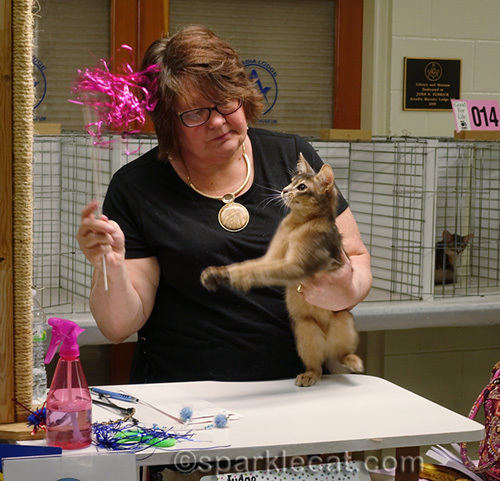 So my human had lots of fun at this show… but she would have had more fun if I had been there. Oh, and if you are wondering how Louie did for the weekend (Billie didn’t get any finals), he got eight finals out of 13 rings! 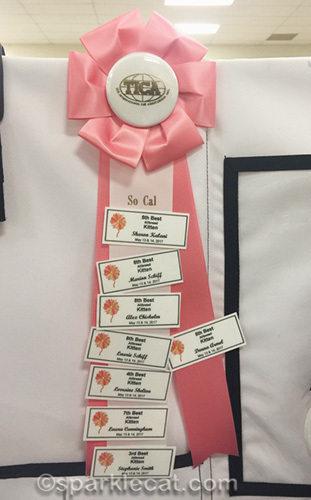 We loved seeing all those show kitties even if they didn’t win…but obviously a lot of them did!Concats to them all! Lovely to see so many beautiful kitties! Billie is especially pretty! Did your human see any devon rexes? Not this show! We do see them sometimes, though. Concats to your kin. I love Mace! That was one fancy weekend for all those kits. Well, Summer, you must be one proud Auntie! 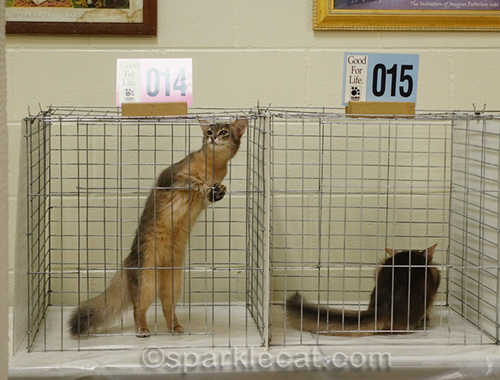 That cat show looks like it was so much fun. Mommy found out about a cat show that will take place an hour or so from her, but she can’t go because she will be at BlogPaws! Yay to all the winners! What great kidlets all! Concats to Louie! What a great show! 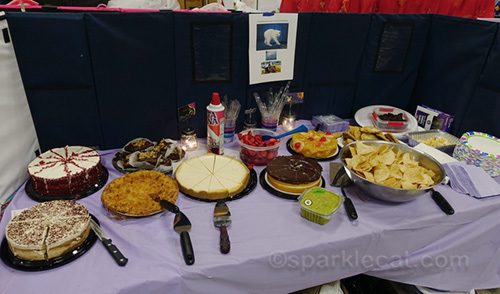 That dessert table is *amazing*…but you and your human sure must’ve missed each other! Wow! Concats to all the finalists and new Supremes! Your family are definitely winners, Summer! Your family is all so darn cute, especially you. Looks like lots of fun! So many pretty kitties! Yay Billie! I agree though, your human would have had a MUCH better time if you were there! Your human documented the show wonderfully. Too bad you weren’t there to rub butts, er paws. Looks like your family did really well, Summer. We especially like Billy but they are all great looking. Concats to all the kitties for their showings! They looked like they were enjoying themselves. It’s too bad you weren’t able to go but it was nice of your human to help out. How fun! So good to see your relatives do so well, or not quite as well, and to see other kitties. We remember Bing and thought he was something special. Apparently, the judges thing so too! We’d love to see some current pictures of Vana! She looked like a Little Lioness, the last I remember! 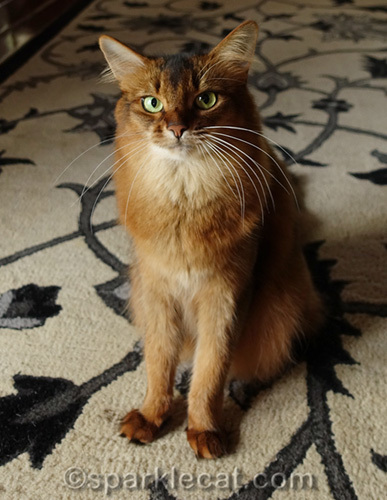 Billie also looks like a Little Lioness Queen! Sizzle looks more like a Cat! We loved seeing all the kitties and how they have been doing. Such beauties too. M said she would not want to be a judge as she’d have to give them all first prize. Your family is amazing pretty Summer but you are tops! louie sounds like a character. Congrats to Louie! We like that picture of Louie and Jedi together. They look like they want to play! Looks like everyone had a great time -but you totally should have been there. Looks like a great time with lots of lovely kitties! OMCs what a beautiful series kitties. WOW Louie and Billie are very handsome/lovely kitties. Have you met them? Wow! What an exciting weekend! Thanks for sharing the photos. Great pics! Billie and Louie are quite the pair!! It was fun to see the other kitties too.